When I first saw this product around a year ago, I was attracted by it’s unique packaging and high price. I didn’t know much about goat’s milk and frankly was a little hesitant, but decided to take the plunge for a new sweet desert experience. It was glad I didn’t chicken out because I ended up discovering a great product! Its funny because fundamentally I shouldn’t like this product. Several years back I got tired of all plain vanilla and chocolate ice creams, and recently tend to gravitate to things which have nuts, chocolate chips, or something else to provide a balanced contrast of flavors. But there is something special about this which makes me always want to come back for more. Texture-wise this ice cream is very similar to typical cow’s milk ice cream, and that is no surprise given these two milks are similar in composition. It’s very creamy and doesn’t get hard in the freezer, so I can eat it right away after pulling it out, whereas some other non-milk based products have odd textures or require waiting to get soft enough to enjoy. When I take in a mouth full of this ice cream my first thought is of plain old chocolate ice cream. But as it sits in my mouth, I begin to notice two things. First, the chocolate (listed 3rd on label) tastes a little stronger than some other brands. I want to describe it’s taste as “refined” or “elegant”, but I think there is some bias on my side since I know the chocolate comes from a name brand chocolate maker (Scharffen Berger). Also, the goat milk adds a new dimension with some subtle flavors not present in typical ice creams. Some describe goat milk as extra sweet, or salty, but I find these words don’t really mean much to me. Just try it yourself and you might just get hooked like I did. In a 90 gram serving there is a 160 calories and 15 grams of sugars. The sugar content is quite low compared to many milk-based ice creams, and comparable to many coconut milk-based ones. The calorie content is also much less than average compared to both other types of products. For comparison I’ll present a brief table with values for a few other products, adjusted by weight. Protein is moderate, at 5 grams per serving. Unlike many other products which are made with unnamed chocolate, this one utilizes Sharffen Berger chocolate, whose chocolate bars you have seen in the grocery store. Scharffen Berger is a chocolate maker founded in 1997 in San Francisco, and was “the first American ‘bean-to-bar’ chocolate manufacturer in over 50 years,” according to their website. I haven’t done any direct taste comparison of their bars and can’t say for certain they do anything special compared to other chocolate products, but for chocolate fanatics this is a nice bonus and might have some nutritional benefits as well. Speaking of nutritional benefits, the main advantage of this product is that is contains goat’s milk instead of the typical cow’s milk found in ice cream. It is claimed that goat’s milk has a few benefits over cow’s milk. For example, it is less likely to trigger allergies, easier to digest, and more friendlier to those who are lactose intolerant. It is also reported to be closer to human breast milk. I can’t say conclusively that goat’s milk is better than cow’s milk, but in the vein of getting a wide selection of different types of nutrients, I suggest trying to add goat milk products to your diet a little at a time. This product has only 11 ingredients, and of those the only one that I would consider debatable is carrageenan, used for it’s thickening properties (among other things). I’ve spoke about this briefly in another post (here) but I wish was not used in ice cream products. Full ingredient list: Goat Milk, Sugar, Scharffen Berger (processed with alkali) semi-sweet chocolate (chocolate, sugar, cocoa butter, lecithin, vanilla), Egg Yolks, Locust Bean Gum, Guar Gum, Carrageenan. This ice cream is quite hard to find. The only place I have seen it sold recently is the Whole Foods Market in Fort Lauderdale (info here), selling at $6.99 for a pint (473 mL). I remember seeing it for a bit more a few months ago, though I don’t remember the exact price. It was somewhere in the range $7.99 to $8.99. In any case I’m glad they dropped the price. Even $6.99 is quite expensive considering you can get many coconut and milk-based desserts for a dollar or two cheaper. 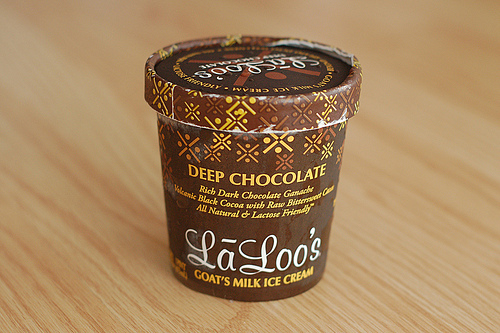 But, given goat milk ice creams are quite rare (I don’t know of any others), it is fair for this to have a certain premium. This goat milk ice cream, natural and delicious, is a great vacation away from your average milk-based ice cream. It’s a little pricey, but its unique flavor makes up for that.